Gabrielle Teschner of San Francisco presents a series of altered old maps hung floating a few inches out from the wall. “Prevailing Winds” is cut out, Ed Ruscha-style, from a map of the "West Indies" (at left). The word “Legend” is sliced from a map of Vietnam, Laos and Cambodia. “Here lies Iran” is cut from a map of West Virginia. “Here Lies Iceland” cut out from west Africa. 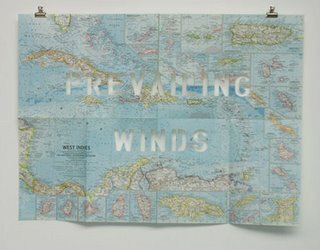 Her interventions seem like the start of an idea still in development, but they begin to speak of the history of mapping and naming places – the power, money, violence and colonialism behind it. To me, they also seem to address how these forces are manifest when folks like the Bush administration marshal doubletalk to redefine or define away the reality right in front of our eyes. Breck Brunson of Washington, D.C., presents photos like “Me as a Toilet Scrubber,” in which he sticks his head in a toilet bowl. In “Me as a Chair (In Use),” the artist is propped up against the wall in a chair-like pose and a white guy sits on him. In “Me as a Jacuzzi,” his head is submerged under the water in a tub as he blows bubbles. 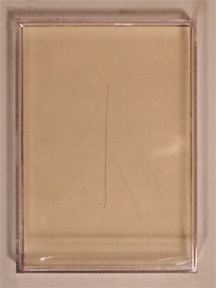 “Me Hair Straightened Out” (at left) is a single, 3-inch strand of dark hair running like a straight line down the middle of a small frame. These charm simply as absurdist stunts, but because Brunson is African-American, they’re also charged with questions about racism. His modus operandi – laugh-wince art – feels a bit too familiar, but there’s electricity in the feelings he churns up. 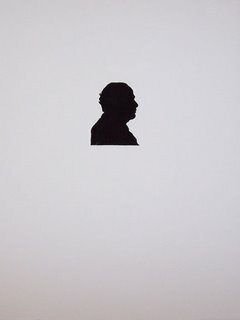 Andrew Tosiello presents “Twenty-five Silhouette Portraits of Italian-American Mobsters” (one at left) in a five-by-five grid of exquisite little black gouache profiles on crisp white paper. Tosiello, who grew up in Medford, studied at BU and is now working on an MFA in San Francisco, aims to use the mafia to address immigration, assimilation, capitalism, the construction of identity, and what he sees as the mafia’s “rise to prominence through similar means and at a similar rate as the United States.” Which was news to me after looking at the work because his paintings are too straightforward to embody the complex analysis he talks about. The work needs to do more to connect the dots. The show also includes work by Edward Lee, who studied at Boston’s Museum School, and Sam Moyer, who spent part of her childhood in Hanover, Massachusetts, and apparently now lives in Washington, D.C.
“We Are Where We Are Not,” Gasp, 362 Boylston St., Boston, Feb. 9 to March 23, 2007.